A growing number of policymakers are wisely advocating that Social Security be expanded, not cut, as a solution to the nation's looming retirement income crisis. Both Democratic presidential candidates have endorsed expanding Social Security, as well as 43 Senators and 143 members of the House of Representatives. In response to the accelerating movement to expand Social Security, those determined to cut its benefits are making desperate, ridiculous arguments. 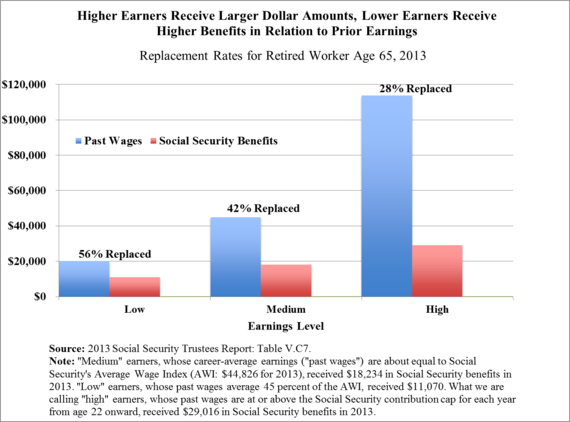 Among other claims, those advocating cuts to Social Security assert that benefits are generous. The American people disagree - and they are right. Americans know that they face a retirement income crisis. A Gallup poll, for example, lists nine financial concerns and finds that retirement worry heads the list - topping not being able to pay medical bills in the event of a serious illness and not being able to pay for children's college. Among those aged 30 to 64, about seven out of ten reported being moderately or very worried about retirement. Future retirees are likely to rely on Social Security for even more of their retirement income in light of the decline in traditional, employer-sponsored pensions and the proven inadequacy of 401(k)s and other savings arrangements as mechanisms to build secure sources of income. Social Security is unquestionably the most universal, secure, efficient, and fair source of retirement income, disability insurance, and life insurance that most Americans have. Its one shortcoming is that its benefits are extremely modest, by virtually any measure. In absolute terms, the average Social Security benefit for all beneficiaries in December, 2015 was $1,228.12, or $14,737.44, on an annualized basis. That is less than full time minimum wage work. It is only slightly above the official federal poverty line, and well below the amount needed to satisfy the Elder Economic Index, a sophisticated measure of the income necessary to meet bare necessities. 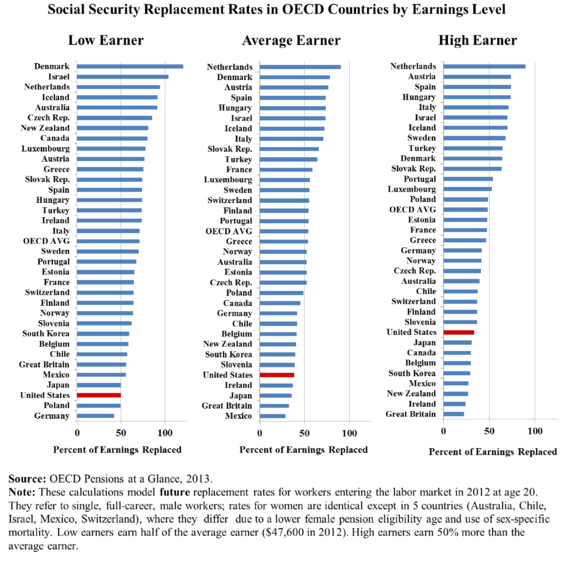 As informative as Social Security's absolute benefit size and its size compared to other nations' benefits, there is a much more important measure. 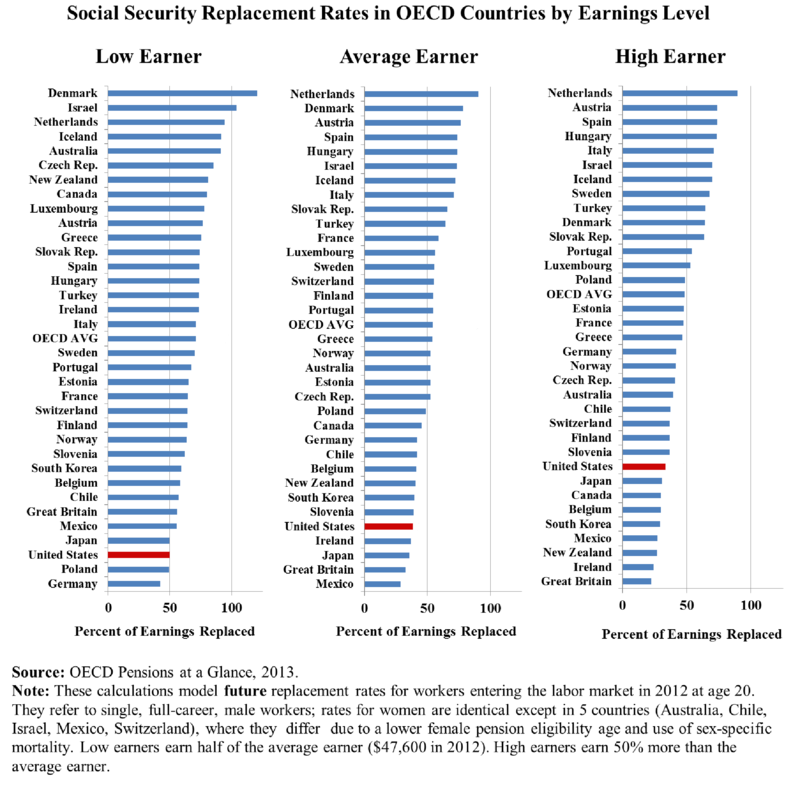 The most important measure of the adequacy of Social Security's benefits is what proportion of pay is replaced, since replacing lost wages is the goal of the program. The idea behind Social Security is that it allows workers and their families to maintain their standards of living if and when wages are lost as the result of death, old age, or serious and permanent disability, precluding substantial work. Experts estimate that workers and their families need about 70 to 80 percent of pre-retirement pay to maintain their standards of living. Those with lower income, who have less discretionary income, need higher percentages; those more affluent, with more discretionary income and other assets, need somewhat less. It should be noted that many retirees do not have as high replacement rates as shown in the chart, because they retire and claim benefits before age 65. Moreover, as modest as these rates are, they will be declining in the future. They have been stable for decades, but are currently declining as the result of benefit cuts that are now being phased in, and increasing Medicare premiums, which are directly deducted from Social Security checks for many beneficiaries. In 1986, workers with average earnings first accepting benefits at age 65 received a Social Security benefit that replaced 41 percent of their preretirement pay, net of Medicare premiums. For equivalent workers reaching age 65 in 2005, only 39 percent of preretirement pay was replaced. For those turning age 65 in 2030, that percentage falls to just 32 percent. When one accounts for taxation of Social Security benefits as well, which is an effective cut in benefits, that replacement rate in 2030 drops to 29 percent. 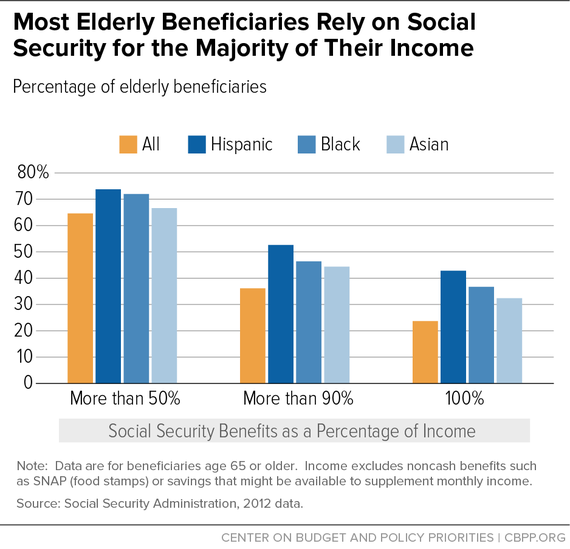 In light of these facts, how are those determined to cut Social Security claiming that Social Security benefits are generous? They cannot dispute the absolute size of the benefits or the international comparisons, but they can seek to monkey with the replacement rate calculations. To argue that benefits are higher than people realize, the main tack has been to suppress information, by sowing confusion about replacement rates. Every year, the Office of the Chief Actuary shows historical replacement rates and future replacement rates, information that, until two years ago, was included in the annual Trustees Report to Congress. Those intent on suppressing this information argued in articles, before Congress, and elsewhere, that these replacement rates were inaccurately low. This, despite the fact that the actuaries' replacement rates with respect to illustrative retirees are consistent with data looking at actual retirees, and rely on the same methodology widely accepted and used internationally. One of the people making the case was also a Social Security trustee, in theory appointed to represent the public but in reality a former staff member in President George W. Bush's White House, who served as the point person for the extremely unpopular proposal to privatize Social Security. He somehow must have convinced his fellow trustees that the report was better without the replacement rates - despite the fact that they had been included in every trustees report for more than two decades and were the work of the career civil service actuaries of the Social Security Administration. Starting with the 2014 report, the replacement rates were removed. Ironically, simply removing the percentages but leaving the rest of the chart as is, as the trustees reports now do, presents the highly misleading impression to the casual reader that benefits are increasing, when in reality they are being cut. In addition to seeking to suppress information about replacement rates and convert a straightforward chart in the annual trustees report to one that misleads, those seeking to make the case that Social Security benefits are higher than they are received a welcome - though temporary - assist from a surprising source. Shockingly, the Congressional Budget Office issued a report in December, claiming that not only will future benefits be adequate, they will be lavish. The results should have raised internal red flags. At the least, they should have given the analysts at CBO pause. Their replacement rates were fifty percent higher than they had projected just a year earlier. They said that benefits for middle income earners were close to what they needed to replace their preretirement earnings and maintain their standards of living in retirement. Perhaps, most shocking, they said that, for the lowest twenty percent of wage workers born in the 1990s and later, their Social Security benefits would be 28 percent higher than their pay! It is not clear how this preposterous conclusion made its way into the public as an official publication of CBO, without someone there catching it. The numbers are at odds with years of findings by the actuaries at the Social Security Administration and indeed, CBO's own previous findings. The CBO findings should also have given pause to outside advocates, if they had not been blinded by their unrelenting goal to cut Social Security. Instead, at least one advocate for cutting Social Security immediately jumped on the CBO's faulty calculations. He immediately placed opinion pieces in the Washington Post, the Wall Street Journal, Forbes and elsewhere, highlighting the CBO conclusions and arguing that those fighting to expand Social Security were off base. 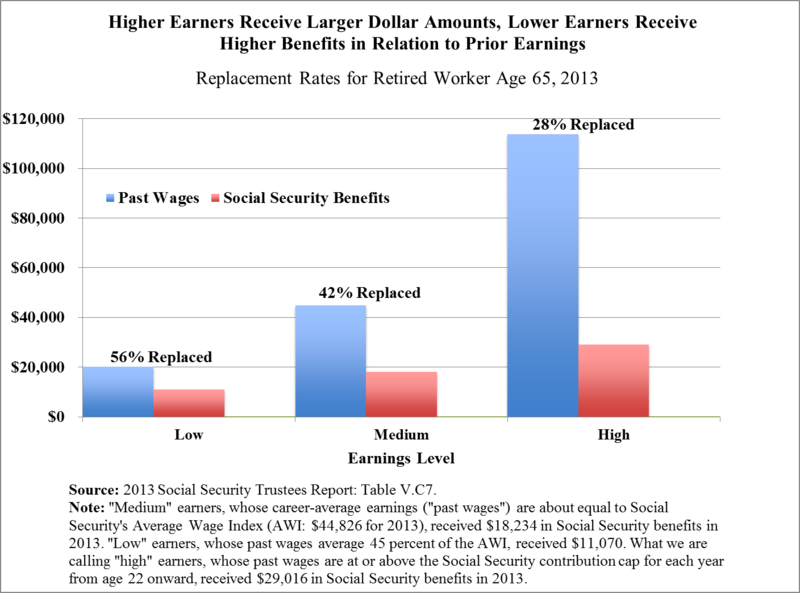 "The corrected version shows substantially lower mean initial replacement rates for retired and disabled workers. For example, the corrected rate for retired workers born in the 1940s is 43 percent; the value CBO reported in December was 60 percent." It may seem arrogant of elite advocates to try to persuade policymakers that they know better what Social Security beneficiaries receive in benefits than the beneficiaries themselves. 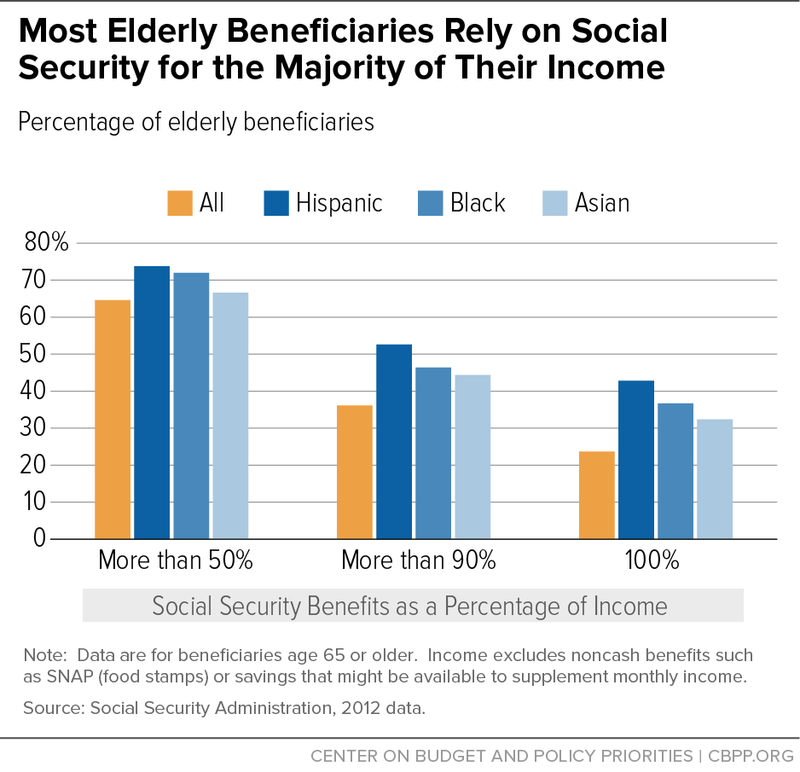 Fortunately, the actuaries at the Social Security Administration, and now the analysts at CBO are producing results in line with the perceptions of the American people - that Social Security's benefits are modest and should be expanded. But don't expect facts to get in the way of those determined to cut Social Security. The argument that there is no retirement income crisis because Social Security's benefits are fully adequate is certain to be made again. Perhaps these deniers should be praised for their willingness to never give up, even when their arguments are laughable on their face.